Often relegated to footnote status in texts, magnesia is nevertheless a valuable substance widely used in applications ranging from wastewater treatment to catalysis. The Chemistry and Technology of Magnesia fills the long-standing gap in the literature with a comprehensive, one-stop reference to "all things magnesia." The book brings together the many strands of information on magnesium compounds, their production, testing and evaluation, technology, applications, and markets. 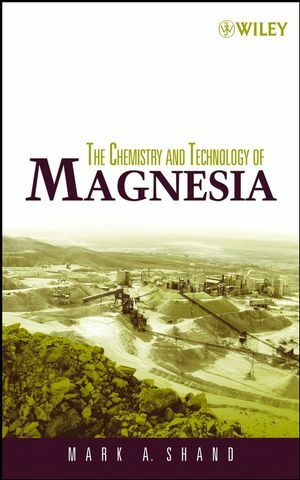 Opening with an introductory history of the chemical, it covers the life cycle of magnesia, natural and synthetic production, and uses in different fields including the environmental, health, and agricultural industries. Readers will find the section on health and safety issues particularly relevant. MARK A. SHAND is the Director of Technical Services for Premier Chemicals, LLC, where he is responsible for the research and development of magnesia chemicals. He has technical experience with dispersion technologies, industrial and municipal applications, and production of magnesia and oxide products. In addition, he has written several articles on magnesia and oxide. He is also a member of the American Chemical Society. 2 Formation and Occurrence of Magnesite and Brucite. 2.2 Sedimentary Magnesite—Basis for Carbonate Deposition. 2.3 Serpentine Alteration by Hydrothermal Processes. 2.4 Cryptocrystalline Magnesite Formation by Infiltration. 2.5 Crystalline Magnesite—Replacement of Limestone and Dolomite. 2.7 Worldwide Occurrence of Magnesite and Brucite. 2.8 Physical and Chemical Properties of Magnesite. 2.9 Chemical and Physical Properties of Brucite. 3.2 Composition of Seawater and Brines. 3.7 Sampling and Testing and In-Process Quality Control. 3.9 General Properties of Synthetic Magnesia. 4 Mining and Processing Magnesite. 4.5 Postcalcination Screening and Grinding. 5 Calcination of Magnesium Hydroxide and Carbonate. 5.2 Calcination of Magnesium Hydroxide. 8 Physical and Chemical Properties of Magnesium Oxide. 8.2 Physical Properties of Magnesium Oxide. 8.3 Chemical Properties of Magnesium Oxide. 8.4 Surface Structures of MgO. 8.5 Molecular Adsorption on MgO. 9.1 Production of Hard-Burned Magnesia. 9.2 Production of Dead-Burned Magnesia. 9.5 Purification by Carbonation of Magnesium Hydroxide Slurry. 10 Water and Wastewater Applications for Magnesia Products. 10.3 Advantages of Magnesium Hydroxide in Wastewater Treatment. 10.4 Adsorption of Dyes on Magnesium Hydroxide. 10.6 Bioflocculation and Solids Settling. 10.7 Phosphorus Removal from Wastewater and Struvite Formation. 10.8 Odor and Corrosion Control in Sanitary Collection Systems. 10.10 Silica Removal from Industrial Plant Water. 11 Magnesia in Polymer Applications. 11.1 Magnesium Hydroxide as a Flame Retardant for Polymer Applications. 11.3 Properties Required of Magnesium Hydroxide for Flame-Retardant Applications. 11.4 Novel Applications for Magnesium Hydroxide as a Flame Retardant. 11.5 Polymer Curing and Thickening. 12.6 Antibacterial Activity of Magnesium Oxide Powder. 12.7 Carbon Dioxide Sequestration Using Brucite. 13 Role of Magnesium in Animal, Plant, and Human Nutrition. 13.1 Role of Magnesium in Plant Nutrition. 13.3 Magnesium in Animal Nutrition. 13.4 Magnesium in Human Health and Nutrition. 14 Magnesium Salts and Magnesium Metal. 16.3 Magnesium Oxysulfate (MOS) Cement. 16.4 Thermal Insulative and Fire Resistance Properties of Sorel Cement. 17.2 Chrome Tanning of Leather. 17.3 Magnesia as a Catalyst Support.